Jacob’s Ladder is one in a series of totemic artworks that were made during my 13-year residency in London, UK. My artwork of that era was deeply influenced by the unique materials I encountered at Kew Botanical Gardens (one of the oldest gardens in the world). I was given generous access to wind-felled timber from two hurricanes that had struck Kew hard in the 1980s. Precious wood such as English oak, cedar of Lebanon, pistachio, beech, lime, yew, and others inspired works that honoured the natural organic form of the tree and the richness and individuality of the wood. I sought to reveal the inner life and strength of the original tree — its character, density, and colour — by a sympathetic lyrical response to its original form during the carving process. These works are a direct and sensual response to the form and living material. The totemic form of Jacob’s Ladder creates a reflective and personal relationship between viewer and sculpture. The decisive carved and stepped lines in the work give reference to Jacob’s Staircase to Heaven, acknowledging the glory of nature and its perpetual movement toward the skies. Biography: Sandra Bromley’s artworks have appeared in many solo and group exhibitions in Europe, Asia, and North America. Her multidisciplinary, interactive art includes traditional sculpture as well as video, sound, photography, and installation. She works solo and in collaboration with artists and professionals from other disciplines. 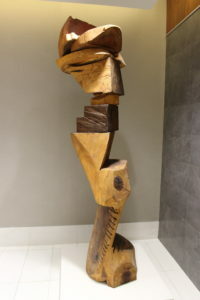 Bromley graduated from the University of Alberta in 1979 with a BFA (Distinction) in sculpture. Since then she has received numerous awards, including: the 2000 Salute to Excellence Arts Award from the City of Edmonton (shared with Wallis Kendal for the Gun Sculpture project); the 2002-02 Canadian Consortium for Human Security Fellowship; a 2006 Global Woman of Vision Award; Alberta’s Centennial Award; a 2009 Honoured Alumni Award from the University of Alberta; appointment to the Royal Canadian Academy of Arts; YMCA Woman of Distinction; Salute to Excellence; Edmonton Hall of Fame (artist and builder); and the Queen’s Jubilee Medal. Bromley is also co-founder of the iHuman Youth Society (serving high-risk youth using an arts-based program) and founder of the Sierra Leone Bo Girls Group, which has an annual fundraiser to aid female victims of war in Sierra Leone.